Difference between revisions of "DC power system"
Eventually I noticed the Epia board had swollen capacitors (the ends got a bit rounded rather than flat). So probably that explains everything: it died because of the crappy caps, and maybe it took the PW80 with it, if there was some excessive current for a while, so I'm no longer thinking there was anything wrong with running the system from DC power. I tried replacing the caps and that board still doesn't work. When I connect it to power the heatsink starts getting warm, and that's the only sign of life. But I've already been using a WRT54GS with OpenWRT for a couple years, so I have a configurable Linux router with a web server, but I just have to get Asterisk installed on the Myth box since the router is underpowered (and doesn't have much storage for voicemail). Eventually I noticed the Epia board had swollen capacitors (the ends got a bit rounded rather than flat). So probably that explains everything: it died because of the crappy caps, and maybe it took the PW80 with it, if there was some excessive current for a while, so I'm no longer thinking there was anything wrong with running the system from DC power. I tried replacing the caps and that board still doesn't work. When I connect it to power the heatsink starts getting warm, and that's the only sign of life. But I've already been using a WRT54GS with OpenWRT for a couple years, so I have a configurable Linux router with a web server, which takes even way less power than the Epia. But I just have to get Asterisk installed on the Myth box since the router is underpowered (and doesn't have much storage for voicemail). So many devices come with their own little inefficient wall warts to supply DC power to them. I wish more stuff was designed for 12VDC - it's the automotive standard. But, then most electronics would still need internal DC/DC converters to get clean 5V or 3.3V or whatever they actually run on. So I got a couple of large solar panels on ebay. My dad gave me some surplus Absolyte batteries that were probably retired from a large data center UPS. Since they are old, they no longer have the capacity that they should, but they work well enough to provide some reasonable backup power. If the grid were out of service for an extended period, I think I could use the 12V powered lights as much as I like, because the solar panels can keep them charged. I started by installing a 12V RV-type fluorescent light in the kitchen, up in the ceiling alongside the AC-powered ones. 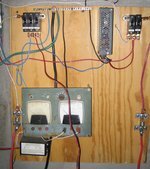 Since I had 4 12V battery packs (with some cells being weaker than others), and 2 solar panels, I opted to build a dual-voltage system. Solar panels are usually designed to charge 12V batteries (for all the RVers that use them) so by putting them in series you can charge a 24V battery. But mostly I want 12V power. So, I have the solar panels charge a 24V battery (made by putting two 12V packs in series) and a DC/DC converter charge a 12V one from the 24V side. They share a common ground. Another thing that influenced this decision is that I found a few Orion ATX PC power supplies on ebay at a reasonable price, so I figured I could use 24V power for PCs, which I need to shut down if the power goes out for more than a few minutes, so as to retain some reserve for lighting and other uses that might be more appropriate in a power outage. At least the PCs can do a graceful shutdown. Of course, the solar panels are not enough for the rest of the time. Modern PCs can take 100 watts or more; at 12V or 24V, that's several amps. My solar panels are rated for about 90 or 100 watts each, but for whatever reason, I'm getting a max of about 2 amps at 24V volts out of them (only about 50 watts). Maybe the charge controller that I got is limiting it, or maybe the panels are just old and tired. The PC that I use as a router has a Via Epia fanless motherboard (600MHz) and only takes about 1 amp at 12V, so that's quite admirable that they have optimized their chips that much. But it is not fast enough for a lot of tasks. It's fine as a router/web server. Trying to run PCs from DC power really makes you appreciate just how wasteful they are. You could (dimly) light your whole house with efficient fluorescent lighting for the power budget of just one fast PC. At any rate, I do like my folding@home scores to be respectable, and if I am to run more than that one low-power machine, until I get some more solar panels, most of the power still has to come from the grid. So I need a bigger power supply to keep those batteries charged. Right now I'm using a variable power supply, which lets me tweak the voltage and current so I don't overcharge them, but it's only good for a few amps, so one of my servers that I intended to run from DC is not being used much, just because I don't have enough power available to run it for very long. It's my MythTV server so it really needs to be a fast one (to do real-time encoding and simultaneous decoding of video, and maybe HD video at that, if it is up to the task). 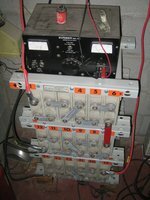 A Whattmeter with PowerPoles on both ends is a very useful troubleshooting and monitoring tool. You put it inline between the supply and the load, and it simultaneously tells you voltage, current, power, and amp-hours. It works over a wide voltage range too, so I can use it on both the 12V and 24V systems. I recently was remodeling one bathroom in the house, and at the same time I wired it for DC. There are some 12V DC powered lights (one LED cluster, and one compact fluorescent), and a DC outlet, which has two PowerPole connectors - one that is always on, and one that is switched by the light switch. The same outlet plate has ethernet as well. 4 PowerPoles together like that very nearly fit into a standard keystone outlet plate, but I had to widen the hole just a bit. One issue I have run into, however, is the possibility of ground loops. Equipment that ships with a "wall wart" often depends on the transformer in it to provide isolation; the DC power is not connected to the AC ground, but left "floating". So, for example, an amplifier might have the shells of its RCA connectors connected to the chassis, which is also connected to DC ground, and therefore when you connect this amplifier to something else, grounds which were meant to be "floating" are then connected together. If the ground of the audio cable duplicates the fact that both pieces of equipment are separately grounded (through the DC power supply, or by being mounted in the same rack), you have two ground connections on each end, and you could get a hum in your audio. Any home-use product with a metal case might or might not have the chassis connected to DC ground (the way automotive electronics always do, because they are designed for just this situation). A cable modem might have one pin of the ethernet connection be connected to ground or to the power supply. RS-232 grounds might or might not be connected to the computer chassis. And so on. So, sometimes you get some surprises when you are trying to operate a lot of stuff from a collection of DC power supplies that all have a common ground (such as my 24V/12V batteries plus the regulators for the lower voltages - the regulators also do not necessarily provide any isolation). In the worst case, something could get fried. So far I haven't had too much bad luck, but I have had some suspicious problems with my cable modem and the DC-powered computer that I have connected to it, which I use as a router. The power cable for the computer was not staying connected properly, but the computer would stay powered on as long as it was connected by ethernet to the cable modem. If I unplugged the ethernet, it powered off instantly, but sometimes it would lose power spontaneously too. Then, its spiffy little PW80 DC/DC power supply let out the magic smoke and quit working. And after that, the cable modem started losing the connection to the cable network intermittently. I don't really understand what was going on, but to preserve DC isolation, I have gone back to running the cable modem from its own wall-wart. (It is now a new cable modem, since the old one was no longer reliable.) In an ideal world, the products designed for use at home would follow a standard to have DC ground connected to the chassis, and for signal grounds to always be "floating," like what is done with automotive stuff. And audio signals ought to always be optical too, but I'm still avoiding replacing my analog amplifiers with "receivers". After the PW80 power supply died, I got it replaced under warranty, and made sure not to connect the machine to anything else which did not have isolated DC power. But, a couple months later, the second supply died anyway. So maybe it is just a crappy design. That is odd, because it was designed specifically for Epia motherboards, and the only other significant load on it is a quiet, efficient 2.5" hard drive. So, I am using one of the Orion supplies (even though it is oversized for such an application - it can run the Athlon MythTV monster machine just as easily). Those come with noisy fans though. To quiet it down, I got some high-quality double-ball-bearing fans, some silicone isolation pads, replaced the punched-out sheet metal fan grill with a wire grill, and finally rewired the fan connections inside the supply to run from 7V instead of 12V (just connect the "ground" wire to 5V rather than to actual ground. 12V - 5V = 7V.) It is now pretty quiet, and with such a light load I don't think there is any chance of it overheating. But this machine is in a 1U case, and that supply doesn't fit, so I had to bring out the ATX connector on an extension cable, and mount the power supply externally on the rack. This page was last modified on 14 April 2009, at 10:50.